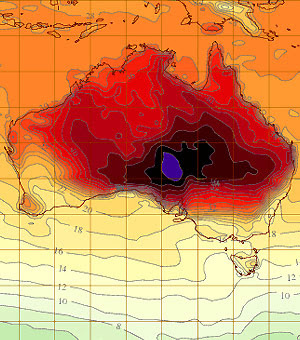 A so called 'dome of heat' had formed over central Australia. This is not unusual at this time of year as it's summer but the temperatures were some of the highest on record with almost 50deg C (122deg F) being reached in some parts. Due to a set of unusual weather patterns 'the dome' moved east and south. The small island state of Tasmania which is normally the coolest in the country experienced extreme temperatures and the inevitable bushfires with more than 100 homes being lost in the south of the state. 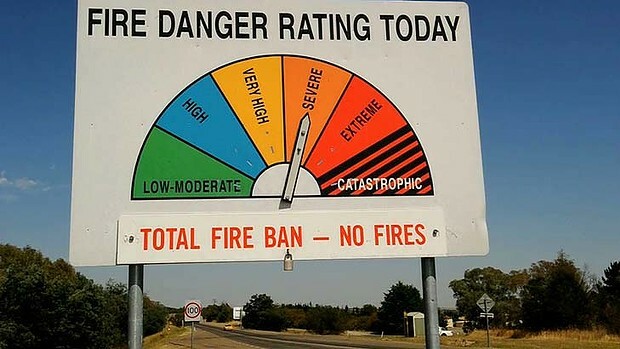 The bushfire warning was cranked up to "catastrophic" and we had messages delivered to us the night before via our landline and mobile phones to activate our bushfire survival plan. We knew we were in for a bad day early in the morning. The temperature at 7am was already 32 deg C (90 deg F) and the wind was gusting strongly from the west. By midday it was 40 deg C (104 deg F) and the winds were 70km/hr north westerly. The perfect storm. We were aware a relatively small fire had started a few days ago to the north west of us and they had been working hard to contain it. Unfortunately the conditions turned it into a raging out of control inferno as it headed east towards the small beach side villages of the Sussex Inlet area. This is about a 45 minute drive to the north of us. We kept track of things through the excellent Rural Fire Brigade web site and were ready to 'hit the road' if necessary. The main road north was soon cut and the residents who had not already left were sent to evacuation centers. It was a pretty chaotic day up there. Lots of pictures and stories from our local paper on this link. As long as we didn't see smoke we knew we were ok.
At 6:30pm the long awaited southerly change came in. The temperature dropped 20 degrees in 15 minutes. The fire up north is still burning today but conditions have eased. The Sussex Inlet villages are no longer in danger but the highway is still closed. 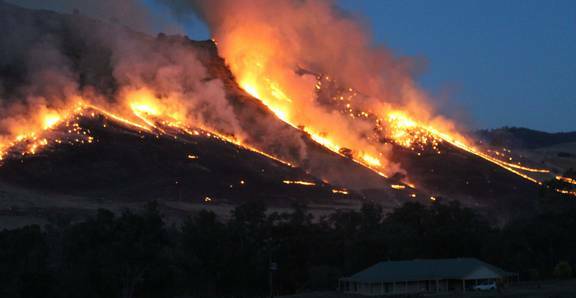 This bush fire has a 44km perimeter and has burnt out an area of over 3,800 hectares. 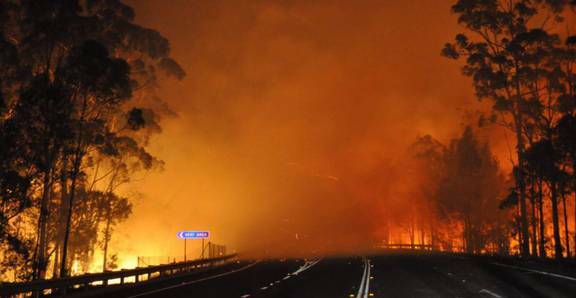 There were over 140 bush fires burning in the state of New South Wales yesterday with around 20 threatening life and property. 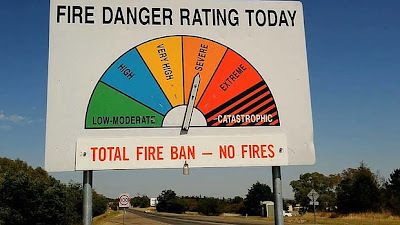 There is still a total state wide fire ban today. This is summer in Australia and I don't think we have seen the last of the fires this season. Update 10/01/13: The above fire is still not under control. Today 100 personnel, 8 helicopters and 27 fire trucks were involved in the fire fighting effort. So far 6500ha have been burnt but there has been limited property damage and no loss of life. Conditions are expected to deteriorate over the next two days with higher temperatures predicted. Update 12/01/13: An earlier than expected southerly change today has helped firefighters get the upper hand in containing the blaze which has now burnt out more than 8400 hectares in the Jerrawangala area. Around 175 fire fighters, with 31 tankers, are still working to contain the blaze over the 100km perimeter. With them are 7 aircraft and about 10 heavy machinery units who will be working to strengthen containment lines throughout the day. The really good news for fire crews was containment lines had held over night and the fire hadn't crossed through a former military range in the rugged and mostly inaccessible north west area which is scattered with unexploded bombs.The containment lines on the eastern side of the fire, near the Princes Highway, were holding and the threat to communities in and around Sussex Inlet had eased. The highway remains open, however this is subject to fire conditions with smoke expected to impact at times during the day. The cooler conditions expected to continue tomorrow and Monday. Update 13/01/13: Much cooler weather (low 20s) with southerly winds bringing in the high humidity and even a suggestion of light showers. Can imagine the firefighters in our area are happier. "Our fire" is still considered out of control with the western front now in inaccessible country and being water bombed by aircraft. Eastern front which has been our main worry is contained. The cooler weather is expected to last a few more days then heating up again by late next week. However a series of lightning strikes in the north of New South Wales have sparked 45 new bush fires. Across the state 130 fires are now burning, 30 of which are not contained. Temperatures in that region have been in the 40s. Moomba in the far northeast of South Australia yesterday recorded a maximum temperature of 49.6 degrees, which makes it the highest temperature recorded in Australia in 15 years. Update 15/01/13: It appears that the threat from the fire has now abated. We have had some rain and the southerly wind stream, apart from bringing in much needed humidity, has pushed the fire to the north west. The eastern perimeter which was our main worry is contained. But the fire is not out and more hot weather and the wrong wind could change this situation. Meanwhile out west of the state the fire situation is dire. Lots of property and stock losses.